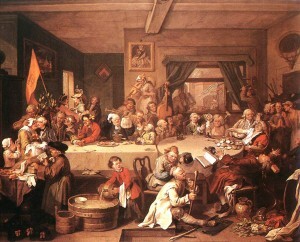 Coffeehouses have been sites of social interaction for hundreds of years. Popular in the Ottoman Empire, the first coffeehouse in Istanbul opened in the 16th century. Despite government concerns in a number of countries over the role of coffeehouses in spreading dissent, coffeehouses continued to be popular in places such as Constantinople, Damascus, Cairo, Paris, Vienna, Venice, and Boston. Coffeehouses were widespread. In 17th century London, a penny would buy you entrance, a cup of coffee and access to lively debates on current events—spaces for commerce, culture, radical thought, and calls to action. Coffeehouses have even been credited as the birthplace of the European Enlightenment. We were inspired to recreate this atmosphere at 6 Degrees. The Coffeehouse Breakout sessions were meant to complement the spirit and dynamism of the 360 Plenary sessions by encouraging deeper, edgy, robust and spirited debate with an aim to capture the mood of the participants and get a sense of what are the practical, rubber-hits-the-road implications of the powerful ideas we are already exploring. Each session was comprised of 120 participants broken up into groups of 10 which were led by a host. The hosts came from a wide range of backgrounds: academics, artists, writers, activists, journalists, and policy-makers. 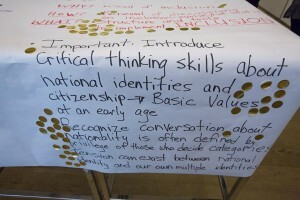 They were given a provocation, intended to stimulate conversation, addressing topics related to inclusion: civic values, tolerance, extreme political movements, limits to inclusion, religion in the public realm, and what it means to be a citizen in a globalized world. 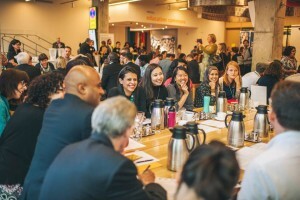 After a series of interactive exercises in which groups came together to discuss their provocations, the entire room had a ‘shareback,’ with representatives presenting their groups’ main takeaways. 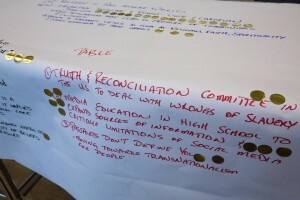 The outcome of each session was to distill a set of three takeaways voted on by participants. This reinforced the atmosphere of a “citizen space” – a space in which those coming from different perspectives worked to build consensus around a wide range of themes. How do we better understand the relationship between immigration and prosperity? How do we define prosperity beyond just economics? What does prosperity mean to newcomers? Interestingly, although the provocations were quite broad and different from one another, these three takeaways have commonalities, and lead to a clear directive on working towards inclusion. The atmosphere of coffeehouse inclusion definitely emulated the descriptions of historic coffeehouses: the room was loud, anyone could come in and out of conversations as they pleased, and there was a feeling of both excitement and urgency. The variation in these takeaways tells us that the concept of prosperity was a starting point for very different and wide-ranging conversations. This ties back to one of the major points made in 360 Prosperity: there is no one definition of prosperity.